I am so happy to announce that I have been nominated for the International World Games Association (IWGA) Athlete of the Year for 2017! To be brutally honest, I was extremely confused at the nomination because 1) I didn’t medal at The World Games and 2) There were many muaythai athletes at TWG who had phenomenal performances and are exceptional leaders of the sport. So I asked Mr. Stephan Fox, how and why? He said I was nominated because of my character and what I have given back to the sport. Even though I did not medal, I continued to move forward and that’s what champions do. In sport and in life, it’s not always about winning. Oftentimes, our greatest lessons are learned when we lose. So the IWGA really liked that and accepted the nomination. I had spoken at a press conference at the IWGA in Wroclaw and they liked how I responded to the questions and they also liked how I appreciated the work of the volunteers. At first I didn’t agree with this nomination, but I see how it is inspirational and important to other athletes. Sometimes, as successful athletes who have won multiple championships and fights, we don’t realize that people are still watching. The fans, supporters, your family and loved ones still look up to you even when you lose. When you win, it’s fun, it’s easy to celebrate and to the athlete, your importance is clear. When you lose, for the athlete, it’s not that clear, you get depressed, you get down on yourself, but people still respect you even when you feel they shouldn’t. It is what you do even after you fall that earns even more respect and draws more inspiration and hope to your fans, the younger generation and older generations. Even though I felt horrible for losing and letting my team and fans down, I DID continue to move forward like I always do. Of course we want to win, but the success and drive comes from your initial passion and it’s not tested until you get knocked down. I have always moved forward and have been passionate about what I do. So I take this nomination confidently because I stand for everyone who has lost and gotten right back up. I am proud product of my Kru, Kru Darwin Miranda and his father, Ajahn Suchart (the father of muaythai in Canada) and his teachings of the art, I am proud to be a part of the IFMA family and really blessed to be mentored by Mr. Stephan Fox because I feel good that Muaythai can stand solid amongst other Olympic sports and be inspirational leaders of SPORT as a whole with the 5 pillars of muaythai as our backbone: Respect, Honor, Tradition, Fair Play and Excellence. I need 10, 000 votes or more by January 15th and I need your help. You can vote every day from now until then. Thank you so much for your continued support and faith in me. I hope to help bring muaythai to another level. 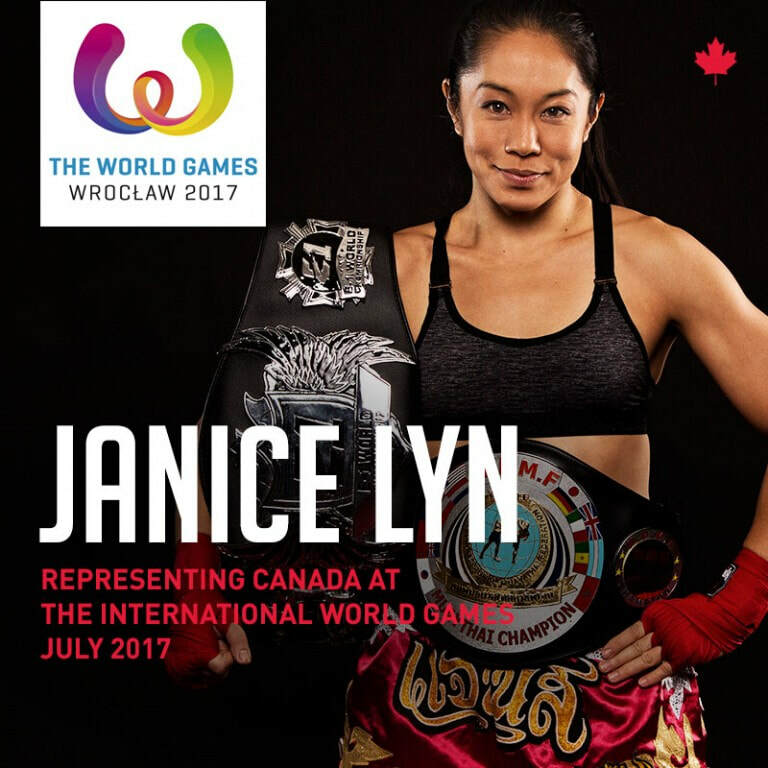 We are excited to announce that after years of hard work and dedication, Janice Lyn has been nominated to represent Canada at the prestigious WORLD GAMES competition in Wroclaw Poland, in July 2017. The World Games is the second most important sporting event in the world following the Olympics and this year is the first year Muay Thai has been added as a medal sport. We are honored for the opportunity to be part of this milestone for Muay Thai and IFMA, and to compete amongst the best Muay Thai athletes in the world. Please share your words of encouragement and love for Janice as her training camp takes full swing over the next few weeks. Janice has been practicing Muay Thai for close to 10 years. Her journey in the sport has taken her across the globe and back, in and outside of the ring. Throughout her years, Janice’s passion and dedication has fostered an impressive collection of championship titles and belts as she climbs her way to the top. Janice won her first pro fight in 2014 (with Mike Tyson in the audience), and has continued to bring home some big wins ever since. In 2015, her passion for Muay Thai was noticed by The International Federation of Muay Thai where she now holds a role as the Athelete’s Commission Executive Board Member. Busy in the ring and outside, Janice holds a masters degree in environmental ecology, and is currently completing her studies in holistic nutrition. Her friendly demeanour, big heart, and relentless fighting spirit have paved the way for female Canadian Muay Thai athletes. The opportunity to compete internationally at such a prestigious event and to represent Canada on the World Stage is a blessing that very few athletes are lucky to experience. Janice is trail blazing for female athletes in Canada and is looking for the right partners to help bring her voice of empowerment, her attitude of self-esteem, and her love for sport and nutrition to the fore front. We are currently looking for sponsors to help with monetary or in- kind donations to help the foster the gold medal dream for Canada. Please click below to read Janice’s full bio and to learn more about sponsorship opportunities.